Softball is a game that all kids can play. There are so many benefits that make it a great game, and highlight why you should use softball as a vehicle for student learning. The game itself can easily be broken down into fundamentals and teachable components that develop the skills required for participation in the more formalised game. Once learned, these help students quickly transition into more traditional softball but also help them with coordination and movement patters that carry into other sports. The Softball Batter Up program provides you with lots of fun games that develop typical movement patterns and encourage strategic decision making. The supporting website offers more than 60 skill development games, each with its own dedicated page. You can watch a video of each game, find out what equipment you’ll need, how to conduct the game and how it relates to the school curriculum. There are even suggested questions you can ask children that demonstrate they are thinking then learning about the activity. If you like the game you’re watching, select it to go in your planner, then from the planner you can drag and drop additional games, reorder them, then save or print your session. You can plan a whole term or just put together a simple lesson in a few minutes. Planning and designing your sessions is easy. But if you don’t have time to plan anything, simply download the pre-planned programs. There are four or six session programs already designed for you which cater for three different year levels, F-2, 3-4 and 5-6. If you’re not sure about any of the games, simply look them up and watch the video. Softball is encouraging for kids because you don’t need to be the biggest or fastest athlete to play. The best thing is, kids of all types can play. The game is easily varied to suit all age and skill levels. Regardless of body type, you can equip students with skills and improve confidence so they do well, not only in sport, but in life. The Softball Batter Up program is easy to learn and enjoy. is safe relative to other sports, so parents and teachers can feel comfort in their children not being exposed to great risk while playing. Plus, there’s never been a better time to get involved with softball if you’re looking for a sport that can inspire students with the recent inclusion for Tokyo 2020. 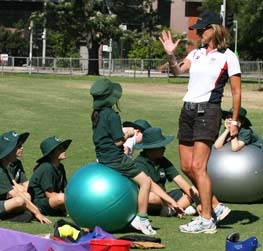 So, why not make softball your choice for Sporting Schools but also for your PE classes or even an ice breaker to get the kids moving? If you need help designing your program, turn to the Softball Batter Up website where you can find all the resources you need to make “Playing, teaching and coaching softball easy”.